The Golden Temple or 'Hari Mandir', situated in the holy city of Amritsar, Punjab, is the most sacred temple of the Sikhs. It is a symbol of the magnificence and strength of the Sikh people all over the world. The temple, a two storied marble structure with a golden dome, stands in the middle of the sacred pool Amrit Sarowar (tank of Nectar) reached through a bridge- Guru's bridge. This temple is a spiritual center and the main pilgrimage place for the Sikhs. The site of the temple and the tank was sacred to the Sikhs since the time of the 4th guru, Ram Das. Many popular myths and legends are connected with the origin of the Amrit Sarowar. It is said that Guru Amar Das found on the banks of the pool the desired herb for the skin ailment of Guru Angad (the second Guru of the Sikhs). The waters in the pond is believed to have medicinal properties. Guru Ram Das at that time, on a visit to a nearby area came to the place to investigate the above episode and was so much impressed with the beauty of the surroundings that he decided to make it a pilgrim center. All Sikh people try to make a visit to the temple and take bath in the holy tank of the temple. The devotees believe that a bath in the tank will cleanse the soul. 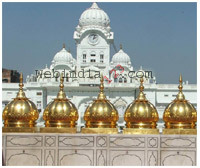 Hari Mandir, a two storied marble shrine in the middle of the tank was built by the 5th Guru Arjan Dev. Within the sanctuary, on a jewel-studded platform, 'Granth Sahib' (The Holy Book of Sikhs) was installed in 1604 three years after the temple was completed. It is kept as the focus of devotion and teaching and the hyms are chanted continuously to the accompaniment of drums, flute etc. The Jubi tree (around 450 years old) in the centre at the east end of the tank is popularly associated with healing power. Many people continue to bring ill relatives to this tree, hoping for a cure. The great Sikh secular leader, Maharaja Ranjit Singh, donated 100 kgs of gold to the temple in 1830 and thus gold was applied to the copper sheets on the roof and the exterior of the building. The temple compound is entered through a Clock Tower. There is a Sikh museum on top of the clock tower comprising a gallery of paintings telling the story of the Sikhs and their martyrs. The tank is surrounded by an 8m wide white marble pavement, banded with black and brown Jaipur marble. The temple has a Dining Hall, Assembly Hall and Guesthouses. The main complex has numerous plaques commemorating Sikhs who became martyrs. There is a community kitchen which serve free meals to thousands of people everyday. Here, anyone from any religion can have food together. Volunteers from the temple help with the kitchen jobs and other works. The atmosphere in the golden temple is exceptionally peaceful and beautiful. The visitors to the temple are not allowed to carry umbrelas and walkingsticks. They are not to wear the shoes and socks. These items can be kept at the cloakroom, in front of the temple, free of charges. Before entering the temple they have to keep their heads covered.